Sometimes the best hair treatments aren’t in the beauty aisle, but in the pantry. “The most obvious benefit [to DIY hair treatment] is financial, but other benefits include the ability to customize treatments for your own special needs,” says Kyle White, lead colorist at Oscar Blandi Salon in NYC. “If you have a specific oil you prefer for its scent or unique benefits, you can use that more heavily, or if you have allergies to certain ingredients then you can avoid them.” Here are some of his favorite recipes for hair masks that you can mix up in your kitchen. Brunettes can tone down brassiness with a grape Kool-Aid or coffee rinse. For redheads, use a cranberry rinse or cherry Kool-Aid to add vibrancy and shine. Blondes can enhance golden tones by combing through a glass of champagne. “The champagne color will bring out any golden highlights while the carbonation gives volume and shine,” says White. 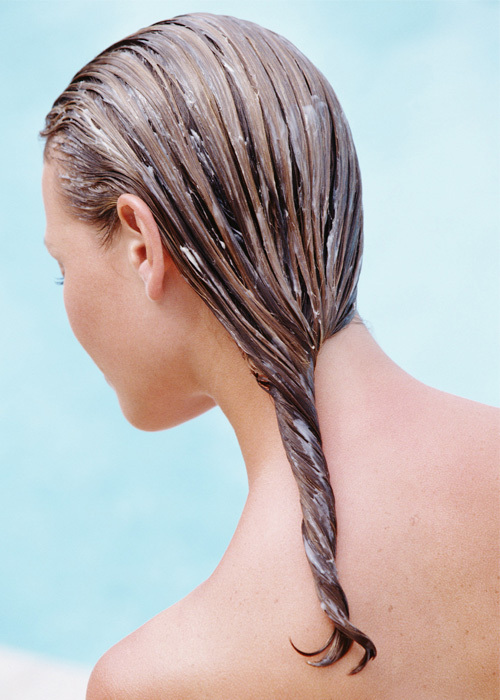 To combat brassiness in blonde hair, use a drop of purple food coloring in your shampoo to neutralize the orange tone. In a food processor or blender, puree the pumpkin and yogurt. Next, add the coconut oil and honey ensuring that the mixture is smooth. Apply the mixture to damp hair. Cover hair with a plastic cap, and let it sit for fifteen minutes. Wash out thoroughly using your everyday shampoo and conditioner, and style as usual.